Ever since the first time I presented my creations to my surrounding, I received a lot E-mails from our dear fellow jewelry makers artists, asking for guidance on making their own jewelry using wire. This step-by-step guide was composed using 58 (including coverpage) high-resolution pictures, this means that at anytime if you would like to zoom in to the document to have better look at the picture details, you may. The image will remained clear for viewing even though you are viewing at 400% of it's originals. In this document, it also listed out the tools and materials used to achieve this composition. The PDF format document will be sent to the E-mail address set in your Etsy account within 8 hours or lesser upon payment received. I hope you will have fun making your Layer-Coiled CrystalPearls Earrings! Do share with me of your creation once you tried it out! 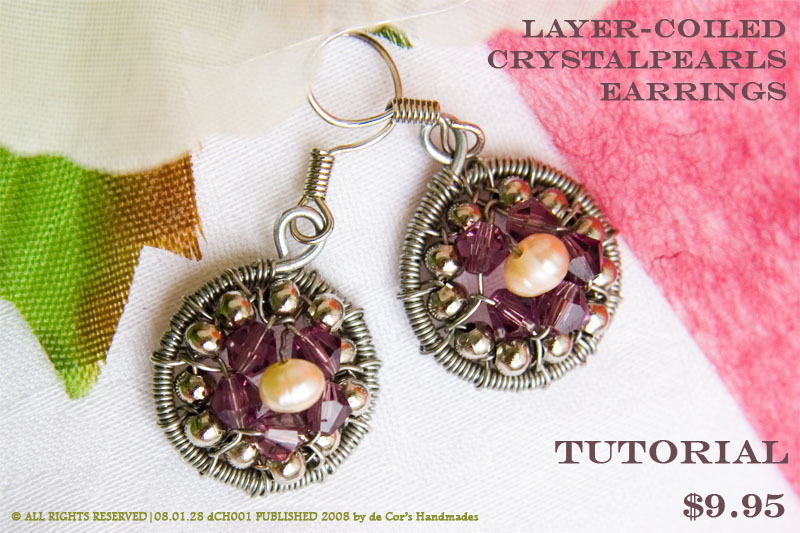 You can also pay for the tutorial via PayPal by sending 9.95USD to decors.l@gmail.com by specifying "DCH001 LayerCoiled Earrings" in the title of the transaction, or click on the below Add to Cart button to purchase. The PDF format file will be sent to your E-mail address specified in your Paypal account.